NEW YORK (Reuters) - Spain’s Carla Suarez Navarro celebrated her 30th birthday in style at the U.S. Open on Monday by beating Russian Maria Sharapova 6-4 6-3 to book her place in the quarter-finals. Sharapova, the 2006 champion, had never lost a night session match in New York prior to her first Grand Slam meeting with Suarez Navarro. Five-times Grand Slam champion Sharapova paid the price for 38 unforced errors and won less than half of her first serve points while committing eight double faults. “I didn’t take care of the chances that I had,” the Russian told reporters. “By chances, I mean the balls that were a little bit shorter. “I hesitated to move forward. The balls where I did attack, I made unforced errors, especially on that inside-out forehand today.”With her most potent weapon not firing, Sharapova succumbed in one hour and 31 minutes under the floodlights at the Arthur Ashe Stadium, allowing 30th seed Suarez Navarro to record just her second career victory over the Russian in six attempts. “Maria is a really good player. I mean, she’s one of the best. 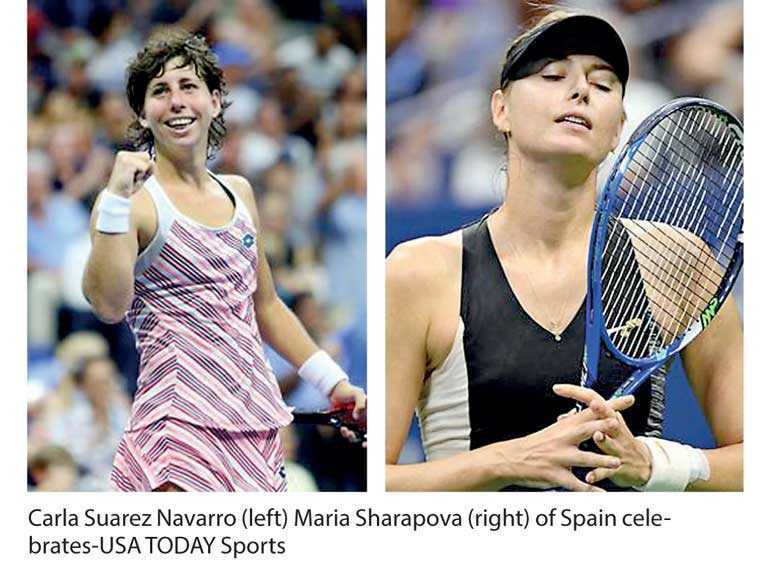 I’m happy to beat her tonight,” Suarez Navarro said.“Sometimes on this court, it is easy to (get confused). Well, the crowd, the music, it’s crazy. It’s a really good show, but for the players sometimes it’s tough, especially for me. The Spaniard will meet last year’s runner up Madison Keys in the quarters and knows she will be the underdog against the 14th seeded American.